Hi, does the HP Officejet 8500A Pro accept your compatible cartridges or recognise them as counterfeit? Also, do you ship to the USA and, if so, how much for shipping? Regards, Maziar Amirkiai. Our premium brand compatible HP Officejet Pro 8500A Plus e-All-in-One ink cartridges work perfectly well in a printer that was purchased in the UK. However, you'll require cartridges with different code numbers for the US version of this printer. Also, we don't deliver outside of the UK so we wouldn't be able to send these cartridges to the USA. How much ink is in each of your compatible HP Officejet Pro 8500A Plus ink cartridges? I've been purchasing compatible ink cartridges with 68ml (black) and 28ml (colour). Do your cartridges have a higher yield? What toner do I need for a HP Officejet Pro 8500A Plus? The Officejet Pro 8500A Plus e-All-in-One is an inkjet printer so it uses ink cartridges, not toner. 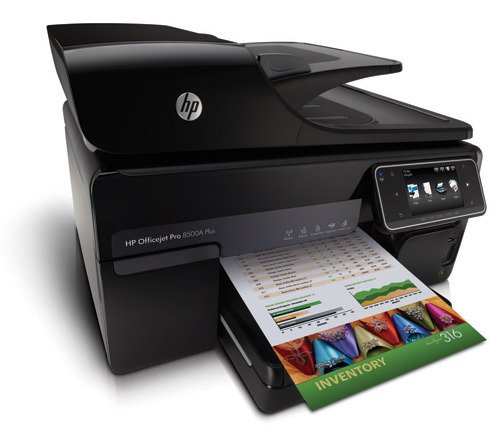 This printer can use any of the HP 940 / 940XL ink cartridges listed on this page. What's the difference between HP 940 and HP 940XL? Will the 940XL work with my HP 8500A Plus printer? The HP 940XL high capacity black ink cartridge contains more ink than the HP 940 standard capacity black ink cartridge. The 940XL ink produces a cheaper cost-per-print and offers better value for money in the long run. You can use either of these cartridges in the HP Officejet Pro 8500A Plus e-All-in-One printer. Simply choose the cartridge which best suits your printing needs. The HP Officejet Pro 8500A is a network ready device that offers end-users a host of intuitive functions including fax, copier, scanner and printing. Aimed at small businesses and home-users, the 8500A produces high quality prints and has excellent connectivity options including the ability to print directly from your mobile phone or tablet thanks to HP's ePrint service. The HP Officejet Pro 8500A Plus e-All-in-One is sleek in its design. It features a slim LCD screen and a range of functional buttons that make the printer extremely user-friendly. The paper tray can hold up to 250 sheets and the Automatic Document Feeder (ADF) can hold 35 sheets. The rear of the printer houses the power socket, USB and Ethernet ports. If you're looking to save money on your print costs then look no further than the HP Officejet Pro 8500A Plus. The efficient printer costs up to 50-percent less per page in comparison to other laser printers. The 8500A Plus e-All-in-One comes with USB, Ethernet, WiFi and ePrint – an award winning service from HP that allows you to print from your mobile/tablet via email – perfect if you need to print something on the move. Print speeds aren't the best, and are disappointing considering that the HP OfficeJet Pro is an ink printer! If you print frequently, or will be attaching numerous devices to the printer then bare this in mind. Aside from speed issues, the HP Officejet Pro 8500A Plus e-All-in-One is a great all rounder, and offers users great value for money.